To edit the grid (layers) select the View/Edit Grid step of the Numerical Workflow and then select the Edit layers button. 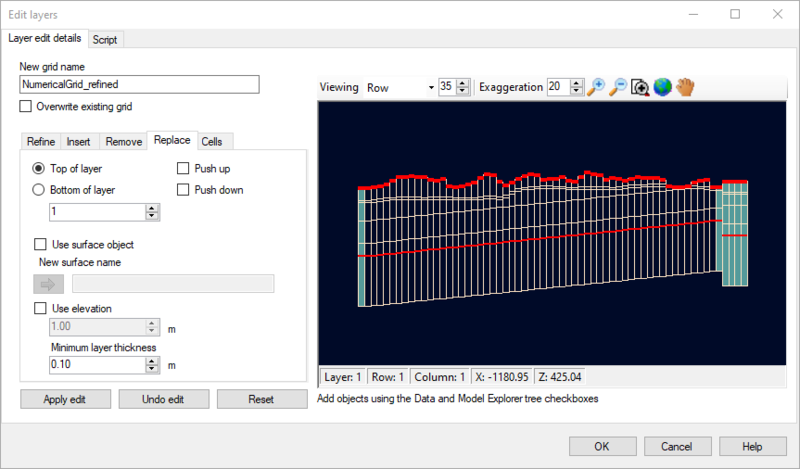 Alternatively, you can find this option from the Model Explorer tree, right-click on the Numerical Grid, and select Edit Grid Layers from the pop-up menu. 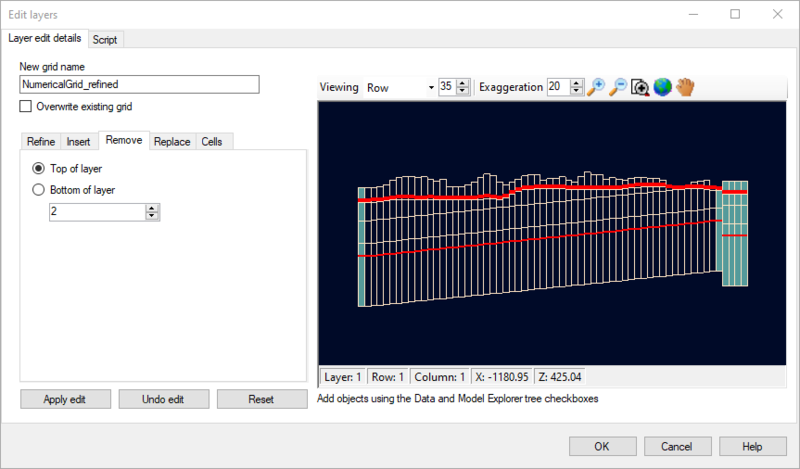 The Edit layers dialog provides options for refining/coarsening/editing a numerical grid. When you edit the grid by default you are creating a new grid - and a default New grid name is generated (you can adjust this if you wish at the time the new grid is generated - once a grid is created, it cannot be renamed). If however, you prefer to simply overwrite your existing grid with the changes you make, simply select the check box to do so. The dialog also provides you with a preview of the grid layers as viewed by a Row or a Column - you can select this from the Viewing drop down options above the preview window. You can then adjust which Row or Column you are viewing using the up and down arrows as well as the Exaggeration. When you select the Apply edit button the preview will be updated with your edits. You also have options to Undo your edit - this will undo your last change. You can keep selecting Undo edit to undo more changes. Reset will return the preview to the original rows and columns. You can add data objects (e.g., boundary conditions, wells, etc.) from the data explorer to the preview to assist you in determining the areas in which refinement/coarsening should be applied. 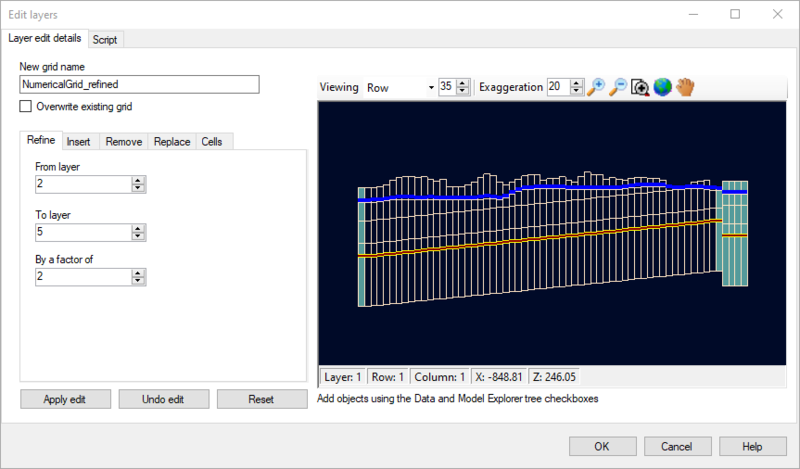 Select the desired data objects from the Data Explorer, and the data will be displayed in the preview. You can select the layer from and to values and then provide a Factor to refine by. For example if you have 8 layers and indicate the From 1 To 8 and a factor of 2 (as shown below) when you select the Apply edit button you would end up with 16 layers (as each of the original 8 layers would be split into 2). When you select which option you want to use you will see in the preview that the selected layer is highlighted in green and when you hover your mouse over the preview the proposed new layer to be inserted will appear as a red line. When you adjust the layer - the preview is adjusted. On this tab you also have the following Push up and Push down options. •When neither Push up nor Push down are selected then the bottom surface pushes up the new surface and the top surface pushes down the surface to insert in order for the values of the surface to obey the Minimum layer thickness criteria. •When Push up is selected then the new surface will Push up all the surfaces (or surface subsets) above this new surface in order for the Minimum layer thickness criteria to be obeyed. •When Push down is selected then the new surface will Push down all the surfaces (or surface subsets) below this new surface in order for the Minimum layer thickness criteria to be obeyed. •When both Push up and Push down are selected then the new surface will combine the behavior of when Push up or Push down is selected - it will push all surfaces below and above the new surface enforcing the Minimum layer thickness criteria. On this tab you can simply select the layer you wish to remove from the preview window or you can specify the Top or Bottom of the layer indicated is to be removed. This tab provides the option to replace either the top or the bottom of a layer with an existing surface (selected from the Data Explorer) or at a specified elevation. Similar to the grid edits - if preferred you can make your layer edits by using the Script option. On this tab you will find the script for any edits you make on the Layer edit details tabs allowing you to learn the script language.